Life can frequently take on an unexpected pace, which is why Jesus urged us to "Consider the lilies..." Events collide, allowing little room to absorb their import. At other times, life tediously slows down and the sameness of it rubs us raw. Change seems remote and despair chokes hope. Whatever your circumstance, if you spend more time reacting rather than acting, it’s time to grasp the power of "Selah". "Selah" is a mysterious Hebrew word that shows up frequently in Psalms. Its precise meaning is a little elusive. Strong’s Concordance has “lift up and exalt” as one probable meaning, as well as “a technical musical term probably showing accentuation, pause or interruption.” We grasp the value of a pause or rest between melodic sections — it gives us breathing room before embarking on what comes next. “Stop and think about it” is another helpful way of understanding the meaning of "Selah". Dividing the Psalm in various ways, "Selah" sometimes appears at the beginning and at other times at its end. Yet it never breaks up a verse or interrupts the flow of thought. Deliberate, precise and pregnant with meaning, "Selah" embodies what we need to do more of — take intentional pauses to think about, lift up, and exalt the precious words that we read in the Bible. In the rush of life that is challenging to accomplish! 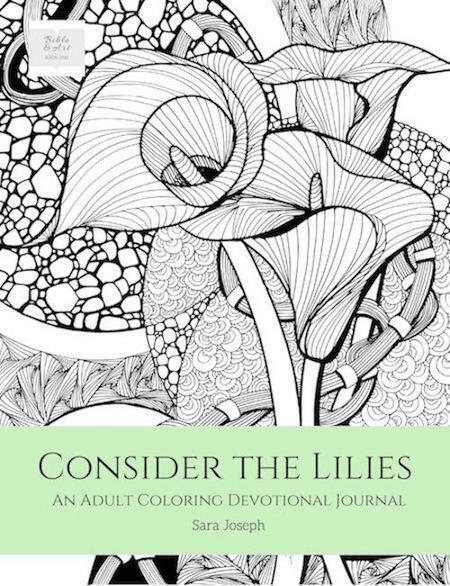 Consider the Lilies: An Adult Coloring Devotional Journal was created to encourage that holy "Selah". Filled with coloring pages of lilies, prompts to encourage meditation, poetry and Scripture references, its generously-sized pages are designed to creatively journal growth. As artists, the perennial jabber of our minds must be shut off in order to draw, paint or sculpt. We enjoy our craft yet struggle to articulate why. Could the making of art be our "Selah" - our pause, our escape into a world that is vastly different from our circumstances? Perhaps. Yet Biblical "Selah" is far more. It is taking time to ponder the riches of God's Word. If we do that while creatively engaged, "Selah" creates an explosive dynamic. Instead of rehashing worries, we now linger upon and experience the transforming power of God’s Word! Regardless of whether you are a skilled artist or you’ve not colored since childhood, this journal is for you. Jesus’ words about the lilies in Luke 12 is its focus. Its pages provide an opportunity to commune with God and to allow Him to incrementally change you from within. Selah! When I first began the drawings for this book, I assumed I grasped Jesus’ words spoken on the hillside, resplendent with lilies in spring. Yet with each drawing, He revealed hidden truths pertinent to me that took my breath away! Understanding came to me in very real terms, specific to my unique concerns of the day. He will do the same for you, if you take the time to create your own "Selah". The objective of this journal is more than just coloring; it is about growing in faith. It is an opportunity to engage in your own "Selah" before Him; responding to the prompts, reading the poetry, meditating on the Scripture and asking God for insight, wisdom and practical steps to change your thoughts and actions. This book is a Bible study, devotional and coloring journal combined in one. Intrigued? Check it out here and get yourself a copy. After you work your way through this journal, please consider rating and reviewing it. I'd love to hear how Jesus met you within its pages!